Staples Easy Rebates! They Really Are Easy! April 1, 2011 · by Zack & Katie · Post may contain affiliate links. See my disclosure policy here. Those of you who have been following this site for a while have probably seen me post something about "free after rebate" items at Staples from time to time. I understand there are some skeptics out there involving rebates. Let me share my experience with Staples Easy Rebate program. I made a purchase on 2/20/11 where I bought 3 items that were I bought 3 items that were free after Easy Rebate. 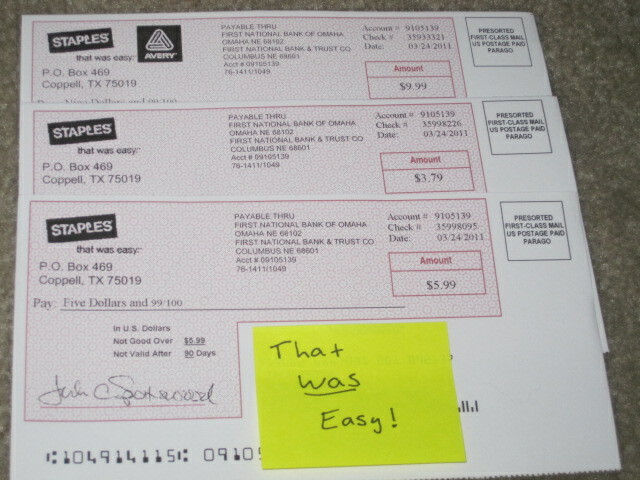 This was the first time I had done a free after rebate deal at Staples. Anyway, today, just about 6 weeks later, I got 3 separate checks in the mail for the exact amounts of the items. Perfect! I have done 2 other free after rebates transactions more recently and will definitely do more knowing how easy it really it. They also have a Paypal payment option which I have not tried, but I assume it would be even easier!